new appendix provisions for fire design. Standard provisions are accompanied by a detailed commentary with explanatory and supplementary information developed to assist users of the standard, including design practitioners, building code committees, and regulatory authorities. Standard ASCE/SEI 7 is an integral part of building codes in the United States and is adopted by reference into the International Building Code, the International Existing Building Code, the International Residential Code, and the NFPA 5000 Building Construction and Safety Code. 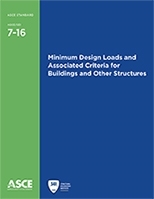 Structural engineers, architects, and those engaged in preparing and administering local building codes will find the structural load requirements essential to their practice.